Forks, WA is a small, economically depressed town on the Olympic Peninsula. It’s economic depression has been recently somewhat alleviated by the publication of the best selling series, Twilight. Forks is the setting for these page-turning novels filled with sparkly vampires and teenage longing. After my utterance, I waited for my sister and mother to call me out, to tell me that I didn’t actually want to go to Forks, but they didn’t. “I want to go there because it’s where Twilight’s set,” I elaborated in case they were unaware. Still no pushback. They began looking for places to stay on the Olympic Peninsual. Their reaction left me disappointed. Why bother to make ridiculous pronouncements if people behave like they’re reasonable statements? Now, before you think that I only said this to start an argument with my family members or to get the burden of planning the trip lifted from my shoulders, there was some sincerity to this statement. Mid high school, I read the entire Twilight series on a dare. A friend gave me three months to read the series, thinking I wouldn’t be able to stomach it. I read the four books in a week. I waited a month before admitting I’d finished them, lest someone suspect that I’d actually enjoyed them. As with many things I do, I was somewhere between seriously wanting to make the pilgrimage to the Twilight promise land and wanting to go as a joke. This is probably why those close to me have such a hard time knowing when to take me seriously. After the Boeing factory tour (a tour I will remember thanks to this dude my age who informed our tour group he was a future Boeing employee and seemed to have memorized the Boeing book of trivia, the same one our tour guide got all his questions from. He monopolized the question asking parts of the tour, peppering our polite, midwestern tour guide with an associates degree in criminology with technical questions about engines.) we drove 4 hours in a northwestern direction to the Olympic Peninsula. We arrived in Forks. 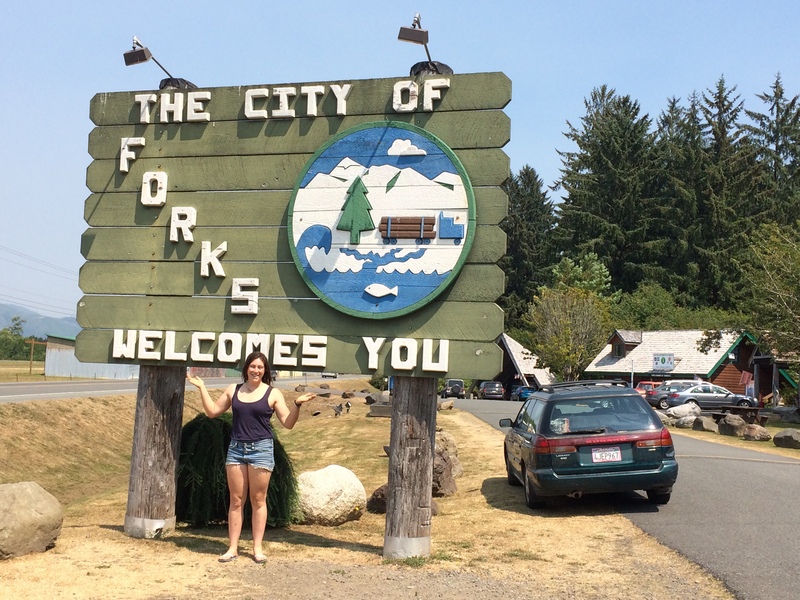 I hopped out of the car, snapped a picture in front of the “welcome to Forks” sign, texted it to a friend, and announced I was ready to leave. It was then that my mother and sister learned why I wanted to go to the Olympic Peninsula. And it was then that I learned that my mother and sister thought the whole Twilight thing was a joke, that I wanted to go to the Olympic Peninsula because of the rainforest and hiking and nature stuff. A lot of learning went on in the span of a few minutes. We then piled back in the Subaru and drove in a strictly southern direction.